In the Summer of 2015, I did a little thought experiment trying to imagine what a "hackathon" might mean at an audio technology company. After all, hackathons are known as not only fun diversions for software engineering staff, but more importantly are also great ways to unleash untapped opportunities for innovation. Then one day, Eureka! I had it! It would be a friendly contest where musically talented staffers create an original audio track within 24 hours. Naturally, an audio technology company like DTS attracts talented individuals with strong musical backgrounds, regardless of profession, whether lawyer, software engineer, marketer, or audio scientist. Some people used to be in famous bands, produced the studio albums for famous artists, mixed audio for Hollywood movies, and much more. Yet in our day jobs, we're caught up in the regular things we need to do to drive innovation: create new audio enhancement algorithms, perform QA on a new SDK, execute contracts with consumer electronics companies, etc. 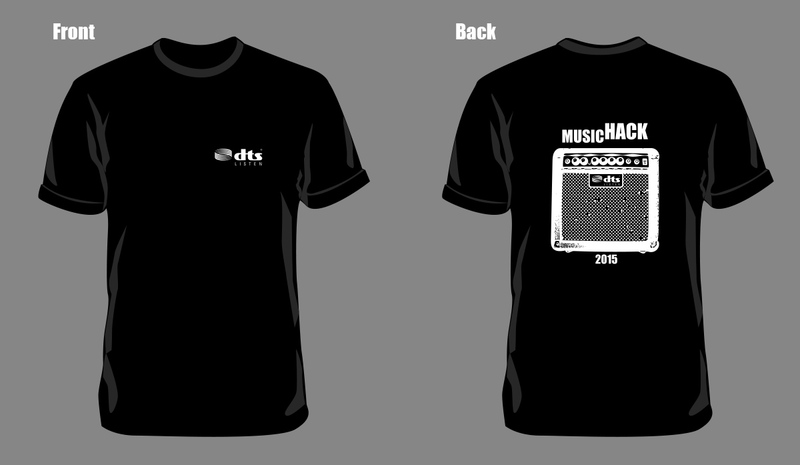 Therefore, a music hackathon would be not only a lot of fun, but also a great way to reconnect with our mutual passion: music. So over the span of a week or so, I put together a pitch deck, got feedback from a few colleagues in various departments, and then sent the polished presentation to management for consideration. And they accepted it! We even got a modest budget to pay for t-shirts and lunches during the event. Immediately, we formed a small task force and I took on the project leadership role. Within the span of 4 weeks, we publicized the event, attracted over a dozen participants from multiple sites around the company, found judges, and lined up studio space. The event itself took place on a Friday in mid-August and participating staff were allowed to take the day off to work on their masterpieces. My Role: Concept creator and project manager. The graphic designer created the logo and t-shirt designs shared here. 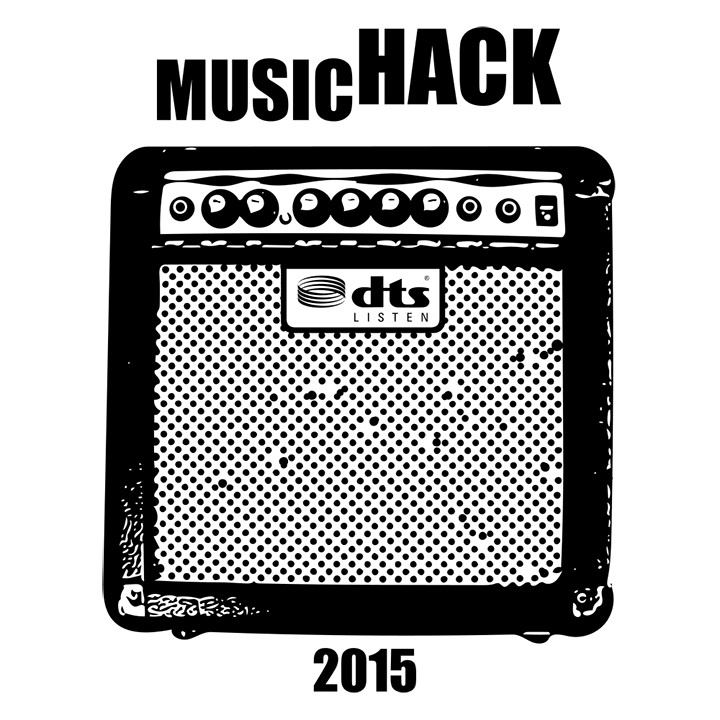 One of the graphic designers I worked with came up with this great "logo" for the Music Hack event. We printed up t-shirts for the participants, judges, and other supporters. The logo was in white on a black t-shirt. I'm proud to say that everyone loved the t-shirts!